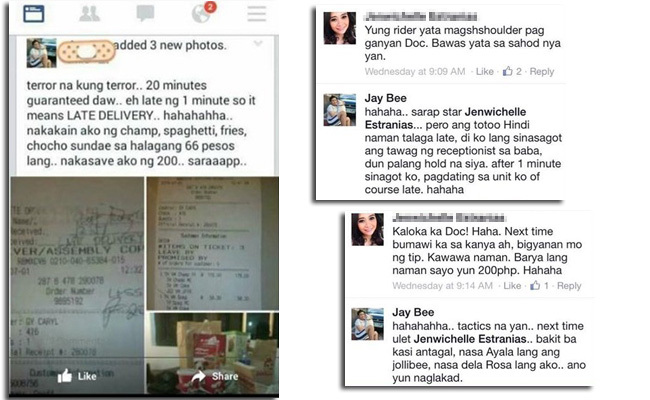 Freebies are usually a thing for Filipinos, especially free food, but netizens cried fouls when a guy named ‘Jay Bee’ boasted that he intentionally used a devious way to get his delivered food for free. This man ordered some food from Jollibee and the operator assured him that the food will be delivered in 20 minutes. If it is late, he will be given a 200 gift card or voucher. So what this guy who claimed to have studied in Ateneo de Manila did was keep the delivery guy at bay at the reception area and pretended not to here the receptionist. He even posted his scamming on Facebook, saying that he kept the delivery guy waiting for a full minute before answering the receptionist’s call. He had boasted that he was able to eat a champ, fries, spaghetti and choco sundae for only 66 pesos. He even posted the receipt. Apparently, a Facebook friend pointed out that what he did was not good and the 200 pesos he had as a discount will be deducted from the delivery guy’s salary. Jay bee did not even seem to mind it and even continued to boast. His post had gone viral and generated uproar from the netizens. Some say that could have just paid for the meal as he has the means and the poor delivery guy risked his life to get there in time. Also many had pointed out that though he had been in a prestigious school, his behavior seemed to be disappointing. Jay Bee then posted his reaction saying that people had only made him internationally famous and he now aims to be in Elle Degeneres show. His post is accompanied by a photo of him making a dirty finger. He said that it is a sign of his gratitude.